As noted, WWE and the USA Network announced the new RAW TV deal today while WWE and FOX Sports announced the new TV deal for SmackDown. You can read the announcements with comments from Vince McMahon at this link and this link. WWE also issued the following press release this evening, touting the new deals. Company executives will host a conference call tomorrow morning at 8am EST to discuss the contents of the release. STAMFORD, Conn.–(BUSINESS WIRE)– WWE (NYSE:WWE) today announced that it has completed landmark agreements with USA Network and Fox Sports, effective October 1, 2019, for the U.S. distribution of WWE’s flagship programs Raw and SmackDown. As part of these five-year agreements, Monday Night Raw will continue to air on USA Network; and Fox Sports will distribute SmackDown Live each Friday on Fox broadcast network. These agreements increase the average annual value (AAV) of WWE’s U.S. distribution to 3.6 times that of the prior deal with NBCU. 1. 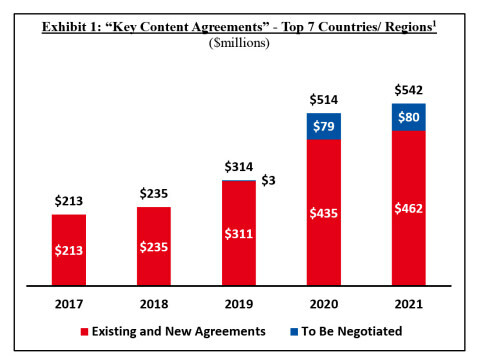 WWE’s “key content agreements” reflect the licensing of WWE’s flagship programs, Raw and SmackDown in certain markets and, as such are a subset of the Company’s core content deals. These markets include the U.S., U.K., India, Canada, LATAM, Middle East and South Africa. 2. Revenue derived from “Existing and New Agreements” is subject to normal risks related to maintaining agreements and counterparty risks. 3. WWE is unable to provide a reconciliation of 2018 and 2019 guidance to GAAP measures as, at this time, WWE cannot accurately determine all of the adjustments that would be required.